Tibetan activists who had attempted to organize a protest against Chinese officials during the eighth Brazil-Russia-India-China-South Africa (BRICS) conference were detained by authorities in Margao, close to Goa, as Indian police arrested over forty members of the community. 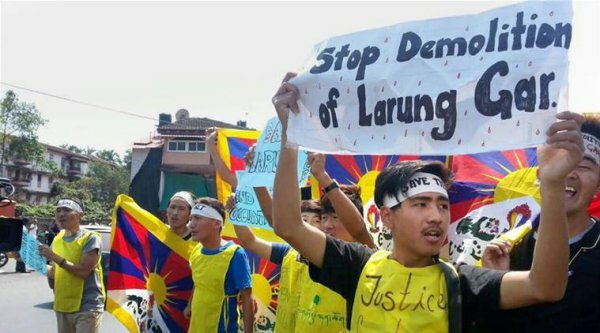 Protestors from the Tibetan community were said to be motivated by the proposed demolition of one of their region’s historic monasteries, and had requested for Prime Minister Modi to raise these concerns before President Xi Jinping. At least 44 Tibetan activists, including 14 women, were arrested as they staged pro-freedom protests in light of the eighth Brazil Russia India China South Africa (BRICS) summit being hosted in the state over the weekend. Margao town police arrested 43 protesters from the town’s old market circle, while a CRPF personnel nabbed a Tibetan protester holding a Tibet flag and handwritten placards in a field near a resort in Benaulim and handed him over to the Colva police. “The Tibetan stood overnight in a field to attract the attention of dignitaries attending the BRICS summit by attempting to jump between their convoy. He has a past record of disrupting meetings,” Colva PI Braz Menezes told STOI, adding that the protester was immediately arrested under Section 151 CrPC. The protesters, who were demanding a halt to the proposed demolition of one of their monasteries, raised slogans and carried placards that read “Free Tibet”. They also demanded Indian Prime Minister Narendra Modi’s intercession to raise their concerns before Chinese President, Xi Jinping, at the ongoing BRICS summit. “We are demonstrating against Xi Jinping, who is responsible for human rights violations in Tibet. Over 144 Tibetans have immolated themselves to protest China’s illegal rule in Tibet and to call for the return of the Dalai Lama. Our non-violence movement will continue,” activist Dhasal, who raised the region’s national flag and a 6x2ft banner that read ‘Free Tibet’ while suspended from a parachute, said. “Prime Minister Narendra Modi should bring the issue of Tibet into discussion to raise our voice and concerns during his meeting with Xi Jinping. Tibet’s independence is the only way to ensure India’s security,” National director of Students for a Free Tibet, Tenzin Tselha said. In Vasco, a group of Tibetan nationals were found roaming suspiciously near the INS Hansa gate on Saturday afternoon. When it was brought to the notice of Vasco police, they immediately arrested them under preventive measures under Section 41. Police said that the Tibetans are refugees staying in Delhi and have come down to Goa. Three girls and two boys, out of which four are students, have been kept in the police lockup. Few Tibetans were seen in the heart of Vasco town protesting against China and demanding freedom. A tent was put up near Vasco railway station. The DySP of Vasco, Sucheta Dessai, had earlier called the representatives and informed them not to protest or be seen near the BRICS arrangements.